6 months & up. 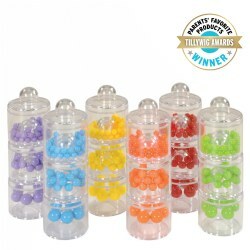 This unique stacker has no center post, stacks in any order and contains no BPA, PVC or phthalates. This Stacker is made in the USA from 100% recycled plastic milk containers which save energy and reduce greenhouse gas emissions. Packaged using only recycled and recyclable materials and printed with soy inks. 8 nesting pieces. 18 months & up. Build confidence with these easy-to-thread tactile beads. 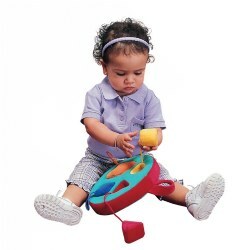 Great for developing fine motor skills and hand-eye coordination. Set of 12 jumbo beads and a string for lacing. 18 months & up. 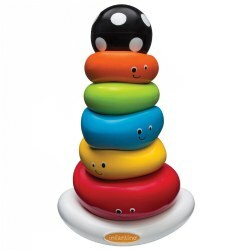 Children will delight in all the fun and engaging learning opportunities available with the Sound and Sort Stackers. Multiple senses are engaged while children listen, look, sort, and stack these 18 captivating pieces. A set of activity cards is included listing all of the benefits and many hands-on activities. 6 months & up. Translucent jug has an easy-open mesh lid. Children will delight in this safe exploration of bugs as they fill the jug and spill the bugs. 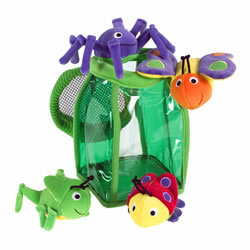 Contains four easy-grasp bug buddies that rattle, jingle, squeak, and crinkle. Machine washable. 18 months & up. 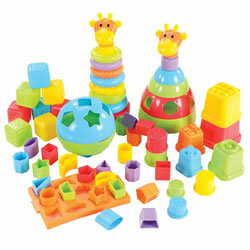 Young children can build, topple, sort, and stack by bright colors and shapes. Surprise--some pegs rattle! 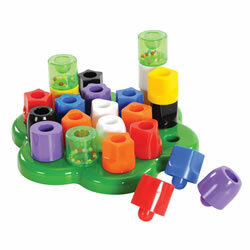 This set includes a base for 3D building and 23 large pegs designed to introduce counting, patterns, colors, and shapes. Colors may vary. 6 months & up. 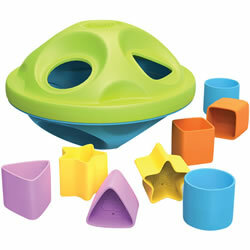 Elliptical shaped sorter with 8 colorful shapes to fit in corresponding holes. Made from recycled milk cartons. Dishwasher safe. Made in the USA. 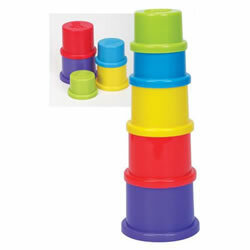 12 months & up.Colorful stacking cups help children develop hand/eye coordination. Includes 5 cups for stacking or nesting fun. Also great for sand and water play. Stacked cups measure 7" tall. Colors may vary. 6 months & up. 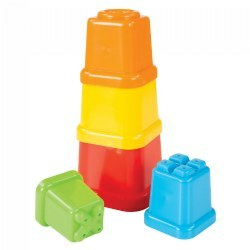 Six graduated, numbered cups are great to use for stacking, nesting, sorting and water play. Each cup is numbered from 1 to 6 on the bottom and is volumetrically accurate. Fill cups 1 and 2, for example, and it will equal the volume of cup 3.They teach basic counting and math concepts. Made from recycled milk containers and made in the USA. Dishwasher safe. Colors may vary. 6 months & up. Soft colorful shapes fit into the circle board. Each shape is attached so you can't lose a piece. Shapes are easy to insert and color coordinated. Surface wash.
6 months & up. 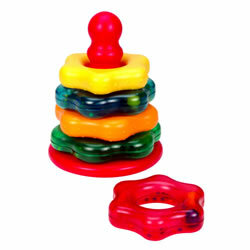 Toddlers can learn their colors, count, and sort by size with these stacking rings and rattles. Includes 5 rings (3 filled with beads) and a stand. 7 1/2" x 6". Colors vary. 18 months & up. Learning how to sort and count made fun and easy! 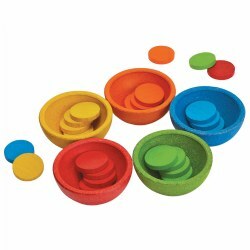 These brightly colored bowls will capture the imagination and help promote basic math skills and organization. Bowls come in five colors: Red, green, orange, blue, and yellow. Includes smooth, round disks for sorting. The disks measure 1 1/2" x 1/4". each. 2 years & up. Who lives in each barn? Colors and visual clues will help the animals find their way home. The 28-piece set includes wooden barns numbered from one to six and color-coordinated animals to match both the number and color on the barn. 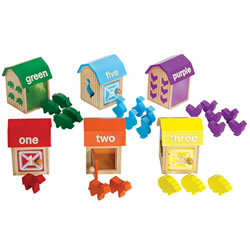 Great for working on counting, sequencing, shape-sorting and color matching skills! 18 months & up. 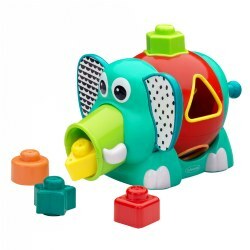 Slide a geometric shape into the corresponding cylinder and a unique sound will reinforce matching and coordination skills. 12 months & up.Colorful, textured stacking cups help children develop hand/eye coordination. 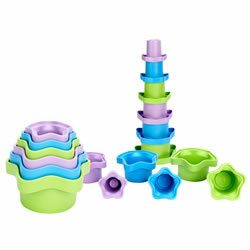 Includes 5 cups for stacking or nesting fun. Also great for sand and water play. Stacked cups measure 12 3/4" tall. Colors may vary. 12 months & up. 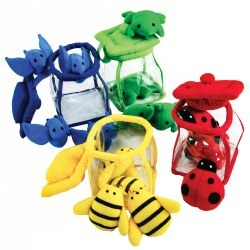 Toddlers learn sorting and classifying skills as they sort the bright color plush objects into their correct color jars. Each jar has an attached lid and contains 4 sorting objects. 7"H.
3 years & up. Everyone loves to stack and connect the chunky components to create colorful robots of all shapes and sizes. 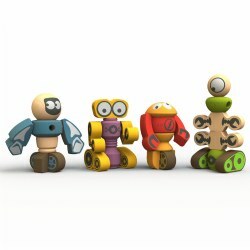 Made from eco-friendly rubber wood with child-safe stains, the playset develops creative thinking and problem solving skills. 12 months & up. 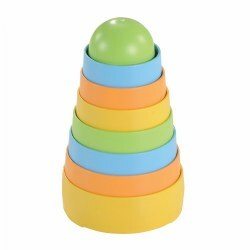 Challenge developing abilities like fine motor, eye hand coordination and early shape recognition with this variety of stacking and shape sorting toys. 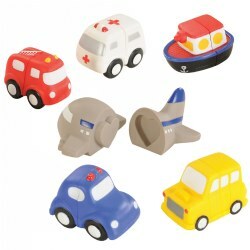 Set includes seven different toys for children to explore. 2 years & up. 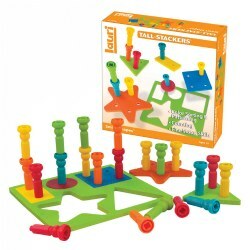 Build on early math and stacking skills with the set of five crepe rubber chunky shapes with 21 stacking pegs and puzzle frame. Activities include sorting pegs by color, matching colors of shapes and pegs and counting the pegs per shape. 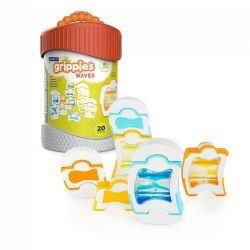 The shapes and pegs are washable and virtually indestructible. Extra Pegs (#30566) are sold separately. 12 months & up. 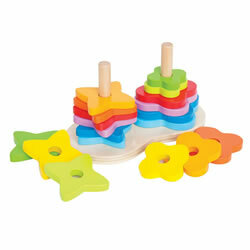 A colorful rainbow of stars and blossom shapes make up this wooden stacking toy. 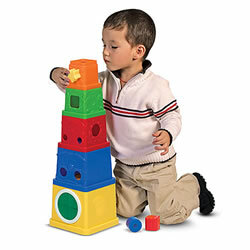 Develops color and shape matching, fine motor and visualization skills. Stacks with or without using base. 6 months & up. 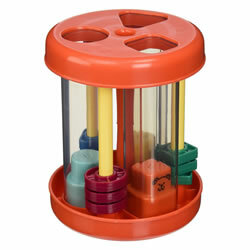 Infants and toddlers boost their hand-eye coordination and motor skills with this ring stacker! Features five uniquely-shaped rings with funny faces and a rocking base. Little ones can learn their colors, count, and sort. BPA free.